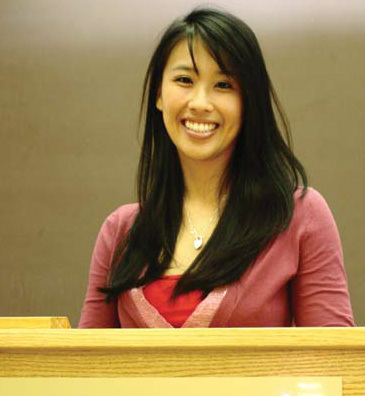 Stephanie Tong is an associate professor in the communication studies area. Her research interests lie at the intersection of interpersonal communication and new media. Specifically, she studies how people initiate, maintain, and terminate relationships using computer-mediated communication. Her research has appeared in a variety of top journal outlets including, Journal of Communication, Communication Research, Journal of Computer-Mediated Communication, and Journal of Social and Personal Relationships. She teaches interpersonal communication, communication theory, and research methods at both the undergraduate and graduate levels. Dr. Tong is the director of the Social Media and Relational Technologies (SMART) Labs, which investigates how technology affects how people make decisions about their relationships. Outside of the lab and the classroom, you will find her in the great outdoors. Her free time is spent rock climbing, running, and hanging out with her 8-year-old rescue dog, a “Chug” (Chihuahua-pug mix) named J. B. Fletcher. If you're interested in learning more about Dr. Tong's research, please visit the SMART Labs homepage. We are always looking for new talent--contact her to discuss open research assistantships and volunteer positions.